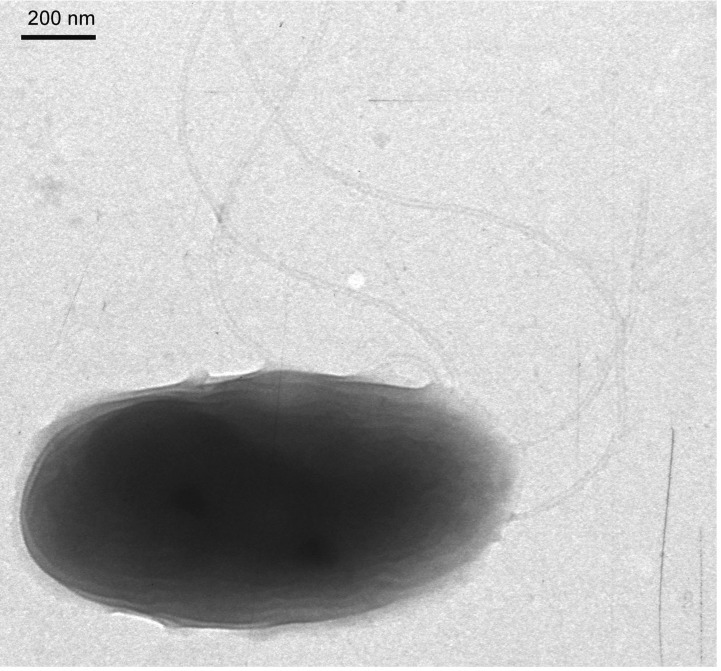 Burkholderia phymatum STM815T is a motile, Gram-negative rod (Figure 1) in the order Burkholderiales of the class Betaproteobacteria. It is fast growing, forming colonies within 3-4 days when grown on yeast-mannitol agar (YMA ,) at 28°C. It is one of the first described members of the β-rhizobia. The strain STM815T, which is the type strain of the species, was isolated from nodules of Machaerium lunatum in French Guiana in 2000 , and the species, B. phymatum, was described based on this single isolate . However, the species has subsequently been shown not to nodulate Machaerium species , but it can nodulate species in the large genus Mimosa [9,10]. Indeed, the symbiotic abilities of STM815T have been demonstrated on numerous Mimosa species, and this strain is now considered to be an efficient symbiont of a broad range of legumes, particularly in Mimosa and related genera in the sub-family Mimosoideae . Strain STM815T is also able to fix nitrogen in free-living conditions . Many isolates of B. phymatum have been sampled from Mimosa pudica in French Guiana , Papua New Guinea , China  and India . 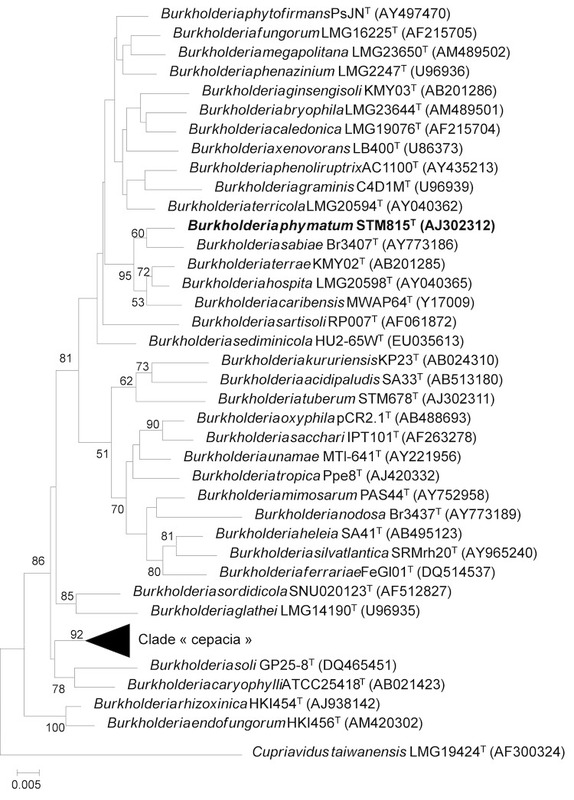 Phylogenetic analyses of core and symbiotic genes have illustrated the ancestral status of Burkholderia species in symbioses with Mimosa [4,5]. 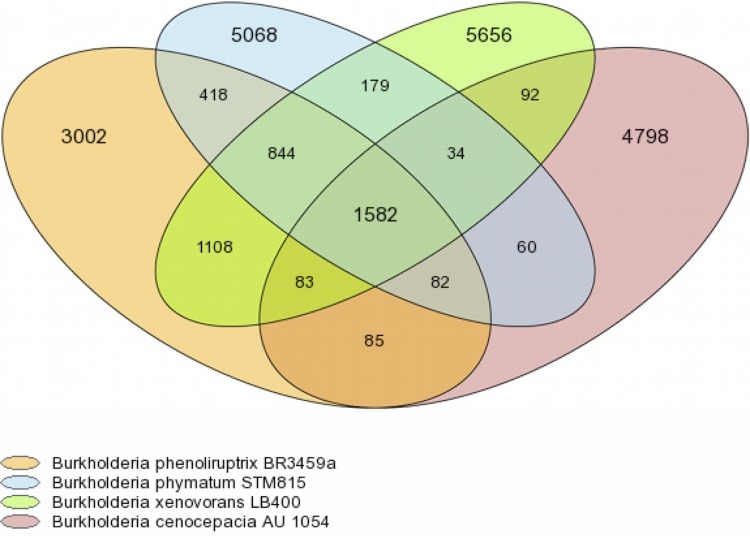 Burkholderia phymatum STM815T is now considered to be a model system for studying the adaptive processes of Burkholderia in symbioses with legumes, in comparison with α-rhizobia. The B. phymatum species is phylogenetically related to symbiotic and non-pathogenic species, and is distant from the “cepacia” clade of Burkholderia (which contains many pathogenic species) (Figure 2, Table 1). Phylogenetic tree highlighting the position of Burkholderia phymatum strain STM815T relative to other type strains within the genus Burkholderia. The 16S rDNA sequences from type strains were obtained from the ribosomal database project , aligned with muscle 3.6, and a neighbor-joining tree was built from a Kimura-2P corrected distance matrix using BioNJ on the Web Site server . Numbers at nodes are % bootstraps from 1000 replicates (shown only if >50%). Accession numbers of 16S rDNA are indicated between parentheses for each strain. C. taiwanensis LMG19424T was used as outgroup. Draft assemblies were based on 115,329 total reads and resulted in approximately 11.2× coverage of the genome. The Phred/Phrap/Consed software package was used for sequence assembly and quality assessment [33-35]. Gaps between contigs were closed by custom primer walks on gap spanning clones or PCR products. A total of 1,282 additional reactions were necessary to close gaps and to raise the quality of the finished sequence. The completed genome sequences of B. phymatum STM815T contain 115,487 reads, achieving an average of 11.2-fold sequence coverage per base with an error rate less than 1 in 100,000. The genome includes two chromosomes and two plasmids, for a total size of 8,676,562 bp (62.3% GC content). Chromosome 1 is 3.48 Mb in size (63.0% GC), chromosome 2 is 2.69 Mb (62.3% GC), plasmid 1 is 1.90 Mb (62.0% GC) and plasmid 2 0.59 Mb (59.2% GC). For chromosomes 1 and 2, 3,140 and 2,358 genes were predicted, respectively. For plasmid 1 and 2, 1,627 and 449 genes were predicted, respectively. A total 7,496 of protein coding genes were predicted, of which 5,601 were assigned to a putative function with the remaining annotated as hypothetical proteins. 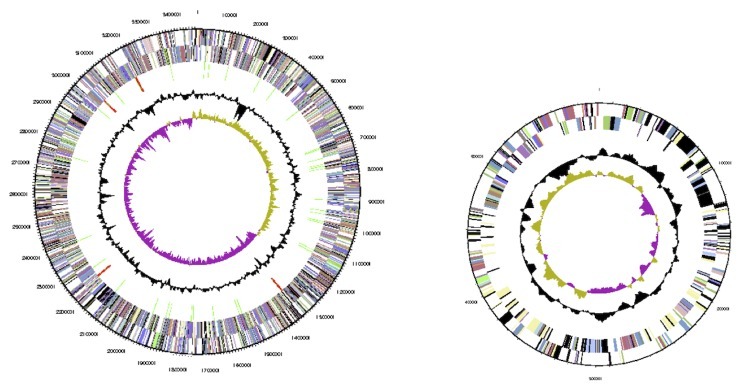 5,630 protein coding genes belong to COG families in this genome. The properties and the statistics of the genome are summarized in Tables 4-6, and circular maps of each replicon are shown in Figure 3 (chromosomes) and Figure 4 (plasmids). Plasmid 2 was identified as the symbiotic plasmid of STM815, as it carried nod, nif and fix genes directly involved in symbiosis as well as several other genes coding for proteins indirectly linked to symbiotic interactions with plants. Among them were found genes coding for the biosynthesis of phytohormones such as indol acetic acid (iaaHM), ACC deaminase (acdS), and genes involved in the biosynthesis of rhizobitoxine (rtxAC-like). A Type 4 secretion system was also identified on this plasmid, while no type 3 system could be detected in the whole genome. This work was performed under the auspices of the US Department of Energy's Office of Science, Biological and Environmental Research Program and the University of California, Lawrence Livermore National Laboratory under Contract No. DE-AC02-05CH11231, Lawrence Livermore National Laboratory under Contract No. DE-AC52-07NA27344, and Los Alamos National Laboratory under contract No. DE-AC02-06NA25396, and French National Agency of Research (ANR) (Project “BETASYM” ANR-09-JCJC-0046). Vincent J. A manual for the pratical study of root-nodule bacteria. I.B.P. Han. Ltd, Oxford: Blackwell Scientific Publications; 1970:vol 15. Garrity GM, Bell JA, Lilburn T. Order I. Burkholderiales ord. nov. In: Garrity GM, Brenner DJ, Krieg NR, Staley JT (eds), Bergey's Manual of Systematic Bacteriology, Second Edition, Volume 2, Part C, Springer, New York, 2005, p. 575. Garrity GM, Bell JA, Lilburn T. Family I. Burkholderiaceae fam. nov. In: Garrity GM, Brenner DJ, Krieg NR, Staley JT (eds), Bergey's Manual of Systematic Bacteriology, Second Edition, Volume 2, Part C, Springer, New York, 2005, p. 575. Vallenet D, Engelen S, Mornico D, et al. MicroScope: a platform for microbial genome annotation and comparative genomics. Database : the journal of biological databases and curation 2009;2009:bap021.